The root tip has three main zones: a zone of cell division, a zone of elongation, and a zone of maturation. Root tips ultimately develop into two main types of root systems: tap roots and fibrous roots. The growing root tip is protected by a root cap. Within the root tip, cells differentiate, actively divide, and increase in length, depending on in which zone the cells are located. Dividing cells make up the zone of cell division in a germinating plant. The newly-forming root increases in size in the zone of elongation. Differentiating cells make up the zone of cell maturation. 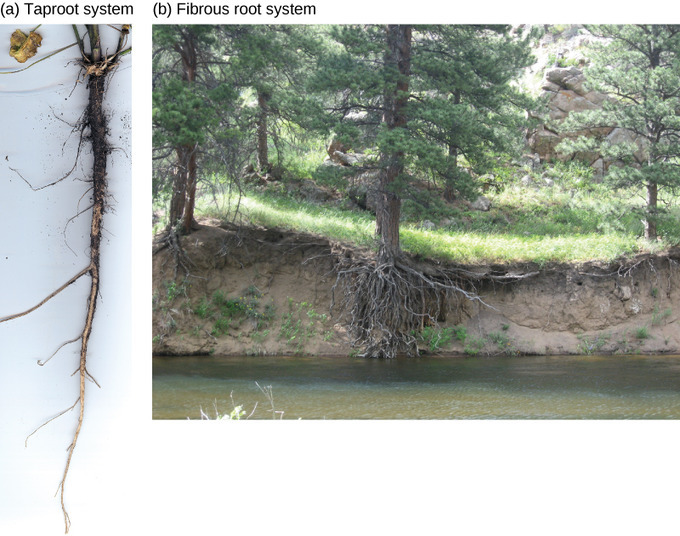 There are two main types of root systems. Dicots have a tap root system, while monocots have a fibrous root system, which is also known as an adventitious root system. A tap root system has a main root that grows down vertically, from which many smaller lateral roots arise. Dandelions are a common example; their tap roots usually break off when these weeds are pulled from the ground; they can regrow another shoot from the remaining root. A tap root system penetrates deep into the soil. In contrast, a fibrous root system is located closer to the soil surface where it forms a dense network of roots that also helps prevent soil erosion (lawn grasses are a good example, as are wheat, rice, and corn). Some plants have a combination of tap roots and fibrous roots. Plants that grow in dry areas often have deep root systems, whereas plants that grow in areas with abundant water are likely to have shallower root systems. Main types of root systems: (a) Tap root systems have a main root that grows down, while (b) fibrous root systems consist of many small roots. Root growth begins with seed germination. When the plant embryo emerges from the seed, the radicle of the embryo forms the root system. The tip of the root is protected by the root cap, a structure exclusive to roots and unlike any other plant structure. The root cap is continuously replaced because it is easily damaged as the root pushes through soil. The root tip can be divided into three zones: a zone of cell division, a zone of elongation, and a zone of maturation. The zone of cell division is closest to the root tip and is made up of the actively-dividing cells of the root meristem, which contains the undifferentiated cells of the germinating plant. The zone of elongation is where the newly-formed cells increase in length, thereby lengthening the root. Beginning at the first root hair is the zone of cell maturation where the root cells differentiate into specialized cell types. All three zones are in approximately the first centimeter of the root tip. 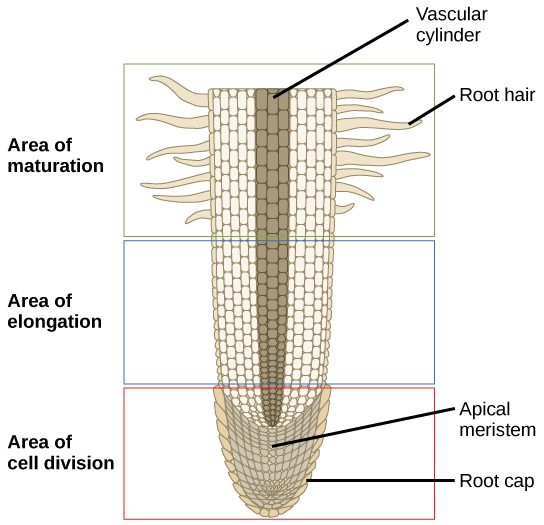 Zones of the root tip: A longitudinal view of the root reveals the zones of cell division, elongation, and maturation. Cell division occurs in the apical meristem. Plants have a wide variety of roots for functions as diverse as structural support, food storage, and parasitism. Storage roots, which include a large number of edible vegetables such as potatoes and carrots, are some of the most commonly-known types of modified roots. Aerial roots encompass a variety of shapes, yet function similarly as structural support for the plant. Parasitic plants have special haustorial roots that allow the plant to absorb nutrients from a host plant. Plants have different root structures for specific purposes. There are many different types of specialized roots, but two of the more familiar types of roots include aerial roots and storage roots. Aerial roots grow above the ground, typically providing structural support. Storage roots (for example, taproots and tuberous roots) are modified for food storage. Aerial roots are found in many different kinds of plants, offering varying functions depending on the location of the plant. Epiphytic roots are a type of aerial root that enable a plant to grow on another plant in a non-parasitic manner. The banyan tree begins as an epiphyte, germinating in the branches of a host tree. Aerial prop roots develop from the branches and eventually reach the ground, providing additional support. Over time, many roots will come together to form what appears to be a trunk. The epiphytic roots of orchids develop a spongy tissue to absorb moisture and nutrients from any organic material on their roots. In screwpine, a palm-like tree that grows in sandy tropical soils, aerial roots develop to provide additional support that help the tree remain upright in shifting sand and water conditions. Aerial roots: The (a) banyan tree, also known as the strangler fig, begins life as an epiphyte in a host tree. Aerial roots extend to the ground, supporting the growing plant, which eventually strangles the host tree. The (b) screwpine develops aerial roots that help support the plant in sandy soils. Storage roots, such as carrots, beets, and sweet potatoes, are examples of roots that are specially modified for storage of starch and water. They usually grow underground as protection from plant-eating animals. Some plants, however, such as leaf succulents and cacti, store energy in their leaves and stems, respectively, instead of in their roots. 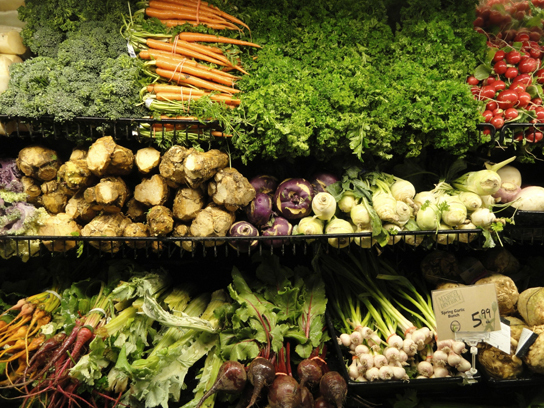 Storage roots: Many vegetables, such as carrots and beets, are modified roots that store food and water. Other examples of modified roots are aerating roots and haustorial roots. Aerating roots, which rise above the ground, especially above water, are commonly seen in mangrove forests that grow along salt water coastlines. Haustorial roots are often seen in parasitic plants such as mistletoe. Their roots allow the plants to absorb water and nutrients from other plants.